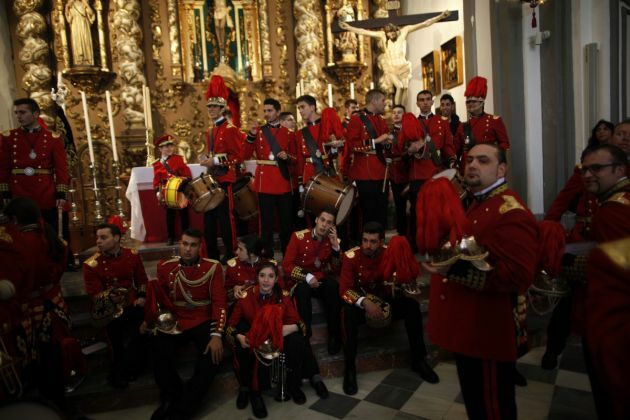 (Photo: Reuters / Jon Nazca)Members of a band gather inside a church after they return from the streets due to rain as they take part in the "Lagrimas and Favores" brotherhood Palm Sunday procession during Holy Week in Malaga, southern Spain, March 24, 2013. Hundreds of processions take place around the clock in Spain during Holy Week, drawing thousands of visitors. This year the Jewish feast of Passover and Christian celebration of Easter are occuring during the same week. Passover begins Match 25 and lasts for about a week. Passover begins on Monday, March 25 and lasts for seven days in Israel and eight days elsewhere. Although the two events both occur in the spring, they do not always occur during the same week. Easter is based on the solar calendar and can occur any Sunday between March 22 and April 25. On the other hand, Passover is based on the Jewish lunar calendar and has a specific date. It always begins on day 15 of the Jewish month of Nisan. Easter is on Sunday March 31 in the Western world this year, although Christians will also have preparatory observances this week on other days related to the crucifixion of Jesus. The close proximity of the two celebrations this year also highlight another connection. There are approximately 350,000 people in the world who are both Jewish and Christian. These individuals observe both the exodus of the Hebrew people from slavery in Egypt under Moses and also celebrate the resurrection of Jesus Christ. These people are popularly referred to as Messianic Jews. The website of the Messianic Jewish Alliance of America desribes them as people who are committed Jews that "believe in Yeshua (Jesus) as the Jewish Messiah of Israel of whom the Jewish Law and Prophets spoke." As historian David Rausch indicated in an article in Christian Century, the movement is controversial. It has opponents among both Jews and Christians. Even so, Rausch notes that the "number of Messianic congregations continues to rise and there is a fervent commitment on the part of these Messianics to 'discover their Jewishness'." Israel is known to have up to 20,ooo Messianic Jews. One of them, an American immigrant named Avi Lipkin, is organizing a Judeo-Christian party to participate in Israeli elections. Jewish author Mark I. Pinsky, an opponent of Messianic Judaism, pointed out on the Huffington Post blog that there are also notable individuals within the movement in the United States. Among the leaders he mentioned are New York Times best-selling author Jonathan Cahn, broadcaster Sid Roth, and legal advocate Jay Sekulow. All three can be seen regularly on cable news in the U.S.
Sekulow has a brother who is a Messianic Jewish rabbi in Atlanta, Ga. He said on his radio program recently that Messianic Jews celebrate the resurrection of Jesus Christ like other believers, but do not necessarily follow the traditions of the Gentile church. Sekulow noted that the Messianic Jewish believers celebrate the resurrection of Jesus at the Jewish Feast of First Fruits, held during Passover week on Nisan 16. Unlike Gentile Christians, who do not observe Passover in wide numbers, Messianic Jews treat the celebration the same way as other practicing Jews. The key event is the ritual meal called the Seder. Although there are many elements to a traditional Seder, Sekulow said that Jews are called to focus on a few specific aspects. "God calls us to remember three things: the bitter herbs, the unleavened bread, and the Passover lamb", he said. Brad Hirschfield, an American who is an Orthodox rabbi and contributor to Fox News, explained the significance of these elements on the network last week. He said that the herbs are meant to evoke the bitterness of slavery, while the unleavened bread denotes how quickly the Hebrews had to flee Egypt. The biblical book of Exodus records how the Hebrews did not put yeast in their bread because of their haste. It also provides the narrative for the rest of the Passover story. The story tells of the 1o plagues inflicted on the people of Egypt by God. Before the final plague, God instructed the people to put the blood of lambs on their doors. God sent an angel of death to kill all firstborn humans an animals in Egypt. When the angel saw the blood, he passed by the Hebrew homes. The final plague killed the firstborn son of the Egyptian Pharaoh. This promted him to let the Hebrews leave the country. Messianic Jewish rabbi Jonathan Bernis notes that the lamb has special significance for Jews and others. He says that Jesus is "the God-given Passover lamb, provided to the Jewish people." Hirschfield said that while Passover is important, the qualities it is meant to emphasize are universal. "Passover celebrates freedom, family and food", he said. "So ideally it shouldn't be so different." "We should all have a little bit of that, Jewish or not, every day", said Hirschfield.